The women who patronized A. & L. Tirocchi were wealthy Yankee women, mostly from Providence, but also coming from outlying areas of the city and from Newport, Connecticut, and Fall River, MA. These elite families of Providence were friends, acquaintances, and neighbors. Ninety of the Tirocchi clients lived on the East Side in houses of varying grandeur. Of those 90 women, 64 lived in the area bounded by Olney Street, Hope Street, Stimson Avenue, Governor Street, Williams Street, and Benefit Streetan area that might be considered the stately, aristocratic core of the East Side, with homes built primarily in the eighteenth and nineteenth centuries. The 1932 Blue Book for Providence and Nearby Cities, an annual publication that functioned as a local social register, lists the majority of the Providence clients in its pages. The Tirocchis' other clients from elsewhere in Rhode Island, and from areas of Fall River, Massachusetts, and Connecticut generally had a direct connection to one of the East Side clients as relative or friend, and in all cases they lived in equivalent neighborhoods and had equally high social standing. The Tirocchi clients shared leisure activities and civic interests. Many belonged to the Womens Republican Club of Rhode Island, the Rhode Island Historical Society, the Providence Art Club, and the Handicraft Club. With their husbands, they were members of elite clubs such as the Rhode Island Country Club, the Agawam Hunt Club, and the East Side Skating Club. Some also belonged to the National Society of Colonial Dames, whose members trace their families to Colonial times in America. 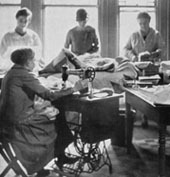 Civic work was done through membership in the Irrepressible Society, which did general charitable work; the Womens Missionary Society, which visited the poor in their homes to distribute aid; and in womens auxiliary groups supporting local hospitals. The Tirocchi sisters rarely advertised, preferring instead that recommendations about their work spread by word of mouth from their valued clients. From the beginning, Madame Tirocchi strove to attract the East Side crowd, the Providence aristocracy. Information about the clients, including records of their transactions and any corrispondence they had with the shop can be found in the People Database.